At the beginning of the war, a group of young Quakers led Philip J. Baker set up a humanitarian project to work in Belgium on civilian relief. Initially neither the army nor the British Red Cross wanted anything to do with this small group of independent pacifists, but the situation changed quickly after the collapse of the British Expeditionary Force. 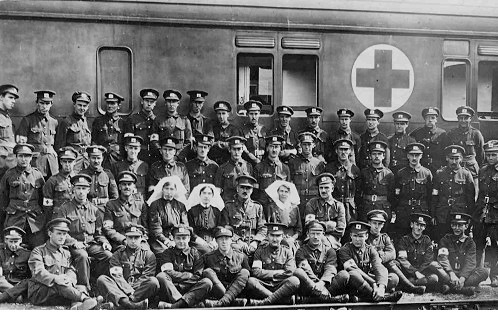 By the end of October 1914, Anglo-Belgian Field Ambulance volunteers were endorsed by the British Red Cross and the Order of St John of Jerusalem and a small group left for France. "A voluntary unit to ease pressure on overworked or inadequate staff"
Corder Catchpole wrote that the Friends Ambulance Units's ideal was "as a voluntary unit is to ease pressure on overworked or inadequate staff". It provided young men with pacifist viewpoints a way to support the wounded, but not the war. It also provided the excitement of working near to the Front and the possibility of "doing one's bit" for one's country in a time of need. Humphrey Nockolds, a skilled doctor, served with the FAU in France from its early days, and was one of very few COs awarded absolute exemption because of his usefulness to the War Office, Herbert Milton also served in France from 1914. Both were decorated for bravery by the French, who saw no contradiction in awarding military honours to conscientious objectors working with the FAU. Humphrey Nockolds was also decorated by the British, in March 1918 he was made an honorary associate of the Order of St John of Jerusalem, he was mentioned in Dispatches by Sir Douglas Haig in April, and he was awarded the Distinguished Service Order in June 1918. For Olaf Stapledon the Unit was a "strange hybrid of pacifism and militarism"  and some Quakers thought it too closely connected to the army to be part of the peace movement. Although this view changed over time and, once conscription was introduced in 1916, it was seen as a suitable alternative to military service. After the initial emergency at Dunkirk, the FAU started on a programme of civilian relief in France; they were soon noticed by the French army medical headquarters, and this led to the staffing and running of French ambulance convoys (Sections Sanitaires Anglaises), and helping in both civilian and military hospitals. In 1915, they started running ambulance trains, and in early 1916 they had two hospital ships. The FAU expanded from its initial 43 men as needs grew, many non-Quakers joined, and its numbers eventually reached 1,200 including those giving administrative support and working on projects in Britain. The photograph to the right is of the Friends Ambulance Unit no 16 Ambulance train from the University of Leeds collection. After conscription was introduced, rather than bring large numbers of FAU members back from the front to appear before Military Service Tribunals, the War Office gave them exemption from conscription, conditional on their remaining with the Friends Ambulance Unit. They also instructed Military Representatives on tribunals not to oppose Quaker applicants, who were willing to join the FAU or were already serving, as was Bernard Vine whose case was heard by the Lewisham tribunal in March 1916, and who had left for France in January. At the same time, membership of the FAU was to be limited to Quakers from now on, although this was not always adhered to, as in the case of William Jackson. The complexity of their situation as conscientious objectors, who were exempt from conscription because they were members of the FAU, is described by Corder Catchpool in a chapter sub-headed "The Challenge of Conscription" in On Two Fronts. He was not alone in feeling that his presence in France might be forcing unwilling conscripts to the front line, or that that their exemption was unfair to COs whose appeals had been disallowed and whose hardships he felt he should be sharing. As a result a number of FAU members resigned and returned to appear before tribunals and like Corder Catchpool became absolutists; although no Deptford or Lewisham members of the FAU did so. Conscientious objectors were also willing to accept call-up into the Royal Army Medical Corps as non-combatants and four of Lewisham's COs who had originally been with the Non-Combatant Corps later transferred to the RAMC.